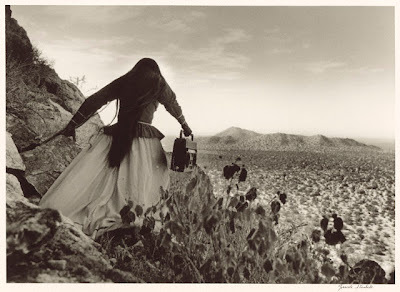 This is a photograph by Graciela Iturbide called angel woman,sonora desert, mexico...1979.
i feel like this picture, a lone lady, disembarking on a long journey of the unknown. Notice the boombox and the tradional dress, new technology and respect for tradition. I am in the studio with Jeff Salzman he produced the killers and the sounds and le rev. Now just me ....solo in the desert of music, recording the experiences giving all my thoughts with no flters. It was a nice day took the bart from 26th st. and mission to the north berkeley station walked 7 blocks to hearst st. the studio is called "the hearst" jefff says it will drive him to the grave. Marcos is our engineer/musician he from mexico city, nice guy. We sat down listen to the three demos i wrote with him last august. showed him the demos of songs from the last couple months. there was a song i started with him in august i had forgotten about its really serious sound...we are talking of having some gospel singers on this track. YAY.... UMMM SO im so sore from snowboarding the first time in tahoe this weekend so fun ill post pics, drove into SF from tahoe this afternoon took a shower... talked to my sister Pam my 13 yr old niece Callie has a cellphone and wants to text me...communication through text messages is exciting i feel so busy i feel like i cant actually talk to anyone, texting is good. Tomorrow morning find out if i get a commercial that shoots in Argentina that i have to fly out wed....Wish me luck... YAY. by the way this picture and the exhibition of Graciela is still on display at the GEtty in L.A.